The newly revived Moab MUniFest is coming up, March 21-23. This has traditionally been the premier mountain unicycling event in the world, drawing over 200 riders the last year it ran. 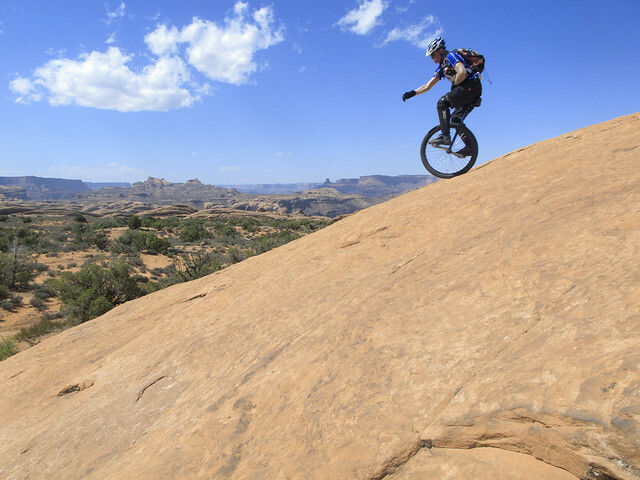 And it’s easy to see why; Moab is a beautiful place, with amazing riding for people of any level. The group will range from expert riders like Kris Holm to people who are just doing their first real MUni ride. It’s a great community event, and there are plenty of outdoor opportunities for friends and family who aren’t part of the uni crowd; some people hike along with the ride or rent bikes, or just go visit the two spectacular national parks outside of town (Arches and Canyonlands). As anyone who has ridden there can tell you, the trails at Moab are long and strenuous. If you want to do three days of riding, or even two, you’ll need to build up your stamina. With that in mind, I’m running a Moab training ride series, starting this weekend and leading up to the event in March. There will be rides every weekend, sometimes two in one weekend to work on recovery. We’ll start with easy, non-technical trails to encourage beginners to get out and build up their MUni skills. We’ll work up to longer rides to develop endurance, interspersed with increasingly difficult, technical rides to work on skills. Whether you’re going to Moab or not, this series is a great opportunity to have some fun and improve your riding and fitness. Here’s the current schedule. All rides will go on regardless of weather, though the location may change on wet days. Dates and locations are subject to change, but there should be at least one ride every weekend until the event. Rides will typically meet at my place at 9:30 AM; make sure you’re on the mailing list to see any updates.